Having led the region through a complex period in its development and only last week saw his vision for the Atlantic Economic Corridor launched, Cllr Patsy O’Brien was roundly praised by associates in the chamber of the Northern and Western Regional Assembly. This year saw the publication and launch of Project Ireland 2040 in Sligo. There are many reasons why the launch came to this region and why the region justifies such prominence in the final strategy. According to Director of the Northern and Western Regional Assembly, David Minton, ‘principal amongst them is the leadership demonstrated by Cllr O’Brien in ensuring the priorities for this region were captured in the National Planning Framework. Patsy managed to leave politics at the door and bring a partnership together from across the nine counties to ensure this place and all our communities continue to receive investment and infrastructure’. Early drafts of the National Planning Framework left out large parts of this region, north of Galway. A strategic intervention led by Cllr O’Brien met with regional Oireachtas members and senior Ministers to engage in meaningful discussions. This intervention ensured that this region is properly recognised with a number of commitments given in both policy and capital investment. Commencing his year as Cathaoirleach he clearly articulated his vision, said Assistant Director Caitlin Conneely. ‘Ensuring the Atlantic Economic Corridor (AEC) saw considerable progression was an essential priority for him’. 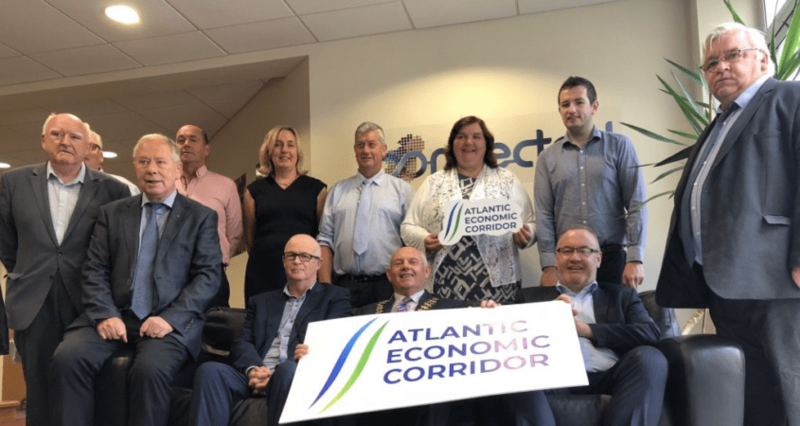 The AEC is now a critical artery in Government policy and the website was launched just this month – www.atlanticeconomiccorridor.ie . Cllr O’Brien said ‘Its not just about a road. Enabling the AEC allows us to feasibly consider enhanced investment in rail connectivity, tourism, enterprise and investment along the western seaboard. We now have a website and AEC Development Offiers in each of the local authorities for strong foundations’. In addition some of the work that went unnoticed for this region is Cllr O’Brien’s involvement in overseeing €31m in expenditure declared to the European Commission supporting Local Enterprise Offices, SME Capacity building, Research Centres as well as Energy Efficiency initiatives throughout the region. Led the Regional Assembly in securing over €32.6M in research, development and commercial grants for stakeholders across the country from EU funding sources. Incoming Cathaoirleach Cllr Seamus Coyle said that Cllr O’Brien ‘steered the ship with such admiration from his colleagues. Representing the region during a particularly important time and ensuring the next generation in all our communities have equal opportunity’.